With more than 200 species of squirrels in the world, the rodents' mating habits, including their breeding seasons, vary widely. Generally, tree squirrels can procreate twice a year, while ground squirrels procreate once a year. Species and size affect when squirrels mature and mate. Ground squirrels hibernate according to weather conditions, moving underground when the weather turns too cold for them. Soon after hibernation begins, female ground squirrels start their estrous cycles, meaning it's time for them to breed. The length of the cycles depends on the species of squirrel, and it impacts whether the female breeds with one male or multiple males: The shorter the estrous cycle is, the slimmer the chance the female will mate with multiple males. Breeding, birth and care take place in the underground nests. The young wean quickly, usually by 6 or 7 weeks old, to gain weight for their winter "sleep." Ground squirrels usually develop more quickly than tree squirrels. Since tree squirrels don't hibernate, their mating process is more out in the open. It's normal for female tree squirrels to mate with more than one male; often, they'll have two litters of babies in a year. 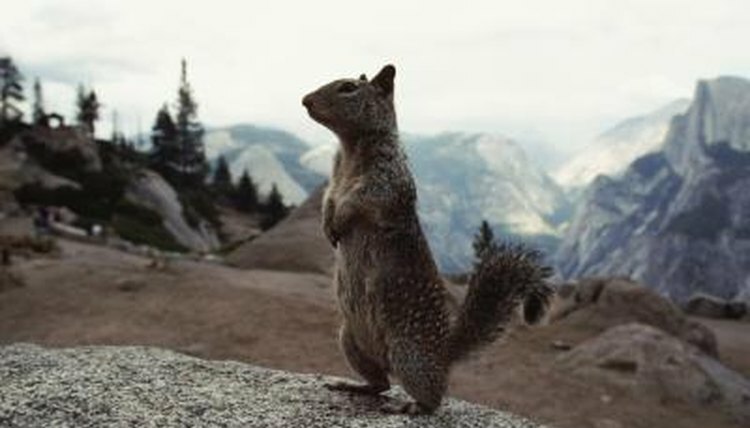 December to January and May to June are normal peak times of breeding for North American tree squirrels. Males follow the scents of females, often engaging in mating chases through tree branches. Depending on the type of squirrel, it will take as little as a month or as long as two months for baby squirrels to develop -- smaller species tend to have shorter gestational periods. All squirrels, whether tree squirrels or ground squirrels, deliver their young in nests, which can be underground, in tree branches or hollows, or in plant undergrowth. Blind and deaf when they're born, baby squirrels rely on their mothers for care. The average litter size is four baby squirrels. Too many factors come into play to set a timelimne for how long it takes a squirrel to mature and become able to procreate. Some squirrels can leave the nest in just about a month and become sexually mature in three months. Other squirrels take three years to reach sexual maturity, though they're independent in less than two months. Life span varies according to species, as well, ranging from 8 to 14 years in the wild. However, the first year of life is challenging for many squirrels, and it's not unusual for a squirrel to not live to see his first birthday.